The Smart Pumper™ was developed out of the need to know (monitor) and control remote sites with precision pump automation based on real time fluid level to the specific level we desired over-time. Obviously, we felt, this would lead to a reduction in operational cost and production optimization and it did in 2008! The Smart Pumper™ development team received a process Patent for its precision pump control method on April 2, 2014, six years after deployment. For decades, the well pumping industry has recognized that fluid level management is critical to their operation. If we dry pump, we damage the pump. If we pump too fast, we can cause a well to sand up. And, frequent starting and stopping a pump is never a good idea which is what the old pump-off controllers do. Since the output potential of a well continuously changes, and before the introduction of the Smart Pumper, you had to continuously evaluate potential and then continuously redefined how best to operate. Fluid entry simply changes over time for a multitude of reasons and now, with the Smart Pumper which recognizes these changes, automates the necessary pump responds to “take from the well the exact amount the well is willing to give” without ever dry pumping. 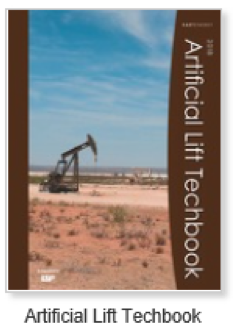 Automating artificial lift systems with Smart Pumper to pump based on this method will deliver a continuous pumping operation that matches inflow perfectly with pump output automatically changing over time and enabling those who manage wells, to manage more wells more effectively. The idea for Smart Pumper™ was laid out by its development team in the mid 1980’s. However, commercial production of the concept was shelved due to the expense and practicality of using electronics from that period. With the advancement of chip and sensor technology, the development team revisited the concept in 2006 because they had wells that needed this solution. In 2007, 25 prototypes were produced and tested in Trinidad and Tobago’s heavy oil fields where extreme heat, high humidity and dynamic reservoir conditions exit. The fluid level-based precision pumping proved to be an enormous success. 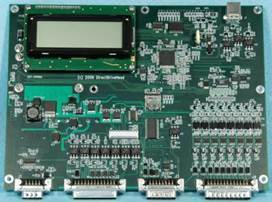 With this success, the team advanced the hardware concept to produce a universal platform to support virtually any sensor, any meter, any VFD and work in any communication networking situation. In 2011, Smart Pumper™ received USA, Canada and Europe certifications (CE FCC ICES-003 NNB-003). Since then it is being deployed worldwide and providing benefit to the oil gas and water industry. Smart Pumper™ is currently manufactured in Dallas, Texas. “Smart Pumper Automation Packages” are assembled in Houston with the VFD and horse power of your choice. Communication is also a built-in feature that works anywhere in the world using the network provider of your choice. 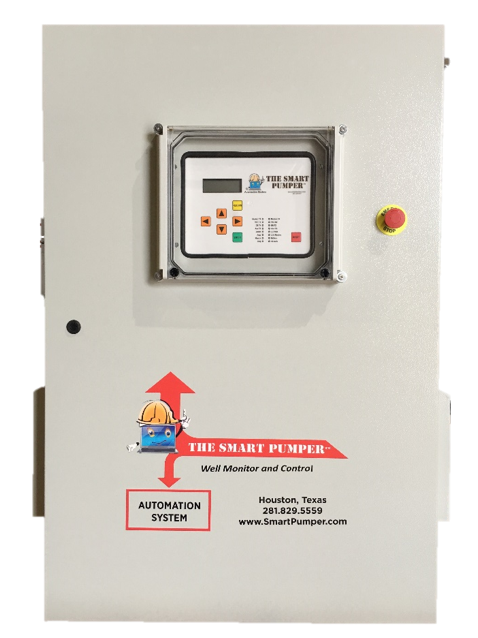 The Smart Pumper™ Automation controls virtually all forms of artificial lift; i.e., ESPs, PCPs, Pump Jacks, Jet Pumps, Hydraulic Lift Systems, Tower Pumps, Permanent Magnet Motors Drive, Gas Lift and other applications. In addition, the system creates an instant control room environment where none exist and provides access to assets from authorized personal devices from anywhere. This is a simple cost-effective solution, particularly for green fields where you have early stage development and where no capital expenditure for old SCADA systems have been made. Municipal Water Districts and Water Ministries can save millions over SCADA when considering the creation of County and/or Country-wide data “SCADA Network” to gather data by simply deploying the Smart Pumper System which is SCADA on Steroids. Within minutes of deployment, your engineers will have a view asset interface with both monitoring and control capability to manage their water wells and facilities. 1. To assess and compare Smart Pumper’s performance, quality control, online web-based automation and its economic feasibility with previous well head systems. 2. To evaluate, monitor and analyze Smart Pumper’s automation performance including data transfer rates from remote locations to workstations. 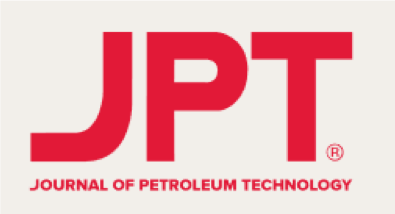 Traditionally, Petroleum Engineers (PE) monitor well performance on a monthly basis based on flow tests, pressure tests, service information and other historical data. Reservoir Engineers (RE) also used pressure data to monitor well behavior, and periodically request a pressure build test so that necessary reservoir calculations and predictions can be undertaken. The well shown is 290w05 in the Calcutta Field. The Smart Pumper™ solution turned out to be a low cost automated variable speed lifting option for PCPs that can also provide PEs with FBHP, FBHT, RPM, etc. to their desktop from the remote locations, saving considerable time in the management of the wells that were so equipped. 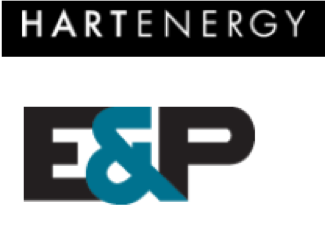 RE’s could also remotely activate a pressure build up test and monitor their pressure surveys in real time at their desktop without dispatching crews to go out and start, record, and then return to restart wells after a test period. They could also make real-time adjustments to the programmed schedule of build-up and draw-down tests, thereby minimizing associated production loss. 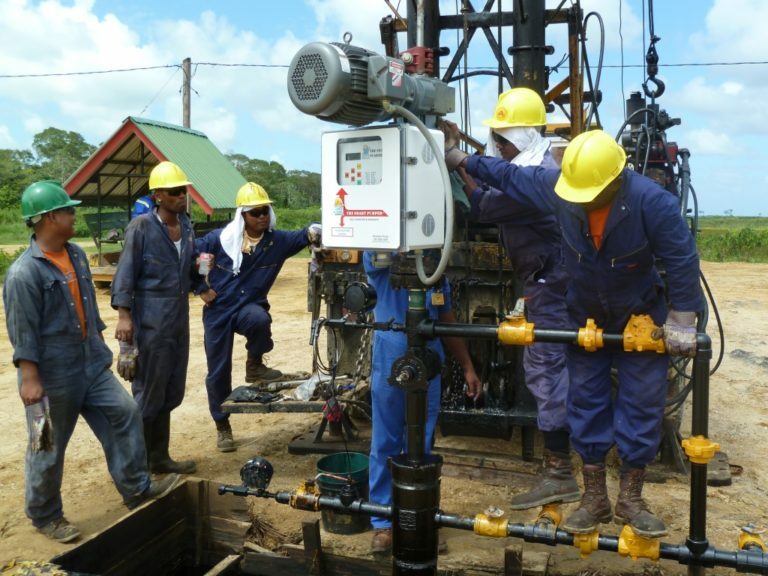 Shown Above: Employees of Staatsolie installing a Direct Drive Head with a Smart Pumper (used to pump wells with a progressive cavity pump) in the Tambaredjo Oil Field in Suriname, SA. User Friendly web-based graphical interface accessible to those with proper user definition and password for specific levels of authority; Administrator, Field Manager, PE, RE, Well Pumper (Operator), Electrical, Maintenance. Event log, Reports, Manage Well Page, and other aspects were easy to navigate. Response time when commanded to change RPM or shut-down averaged 9.23 seconds and was purely based on internet connection speed at our location. Email as well as automated SMS can be programmed. Primary log parameters can be retrieved from the well such as FBHB, FHBT, Volts, Hz, amps, RPM as well as secondary log parameters like torque, theoretical flow and fluid level. For pilot, data flow was from Smart Pumper™ to local cell service provider Digicel, into internet tunnel in Suriname, to server in Houston and back. Cost comparison between current installed system and Smart Pumper™: Smart Pumper™ was half the cost. With Smart Pumper Automation installed on 290w05, there was a 21% increase in barrels produced compared to the prior 10 months primarily due to maintaining better actual real time fluid level control. Fluid level control via the variable frequency drive (VFD) linked to the Smart Pumper’s proportional integral derivative (PID) controller is quite smooth. The point from which there is a perturbation until this is corrected to the target level programmed matches; i.e., if you stipulate 90 days, it takes 90 days to target (once the pump is sized correctly). The data retrieved from the online dashboard of well 290W05 is repeatable within the 6 sigma (standard deviation) band. During the 12-month pilot, there were no maintenance issues that hampered the functionality of the Smart Pumper Automation. A 100% uptime was registered. The Smart Pumper Automation Package was user friendly and, once installed, immediately transferred the data to the online server with an average 9.23 second response time per signal command or data retrieval. Case study was conducted in 2G Environment. With the system installed, developers realized a reduction in travel time and cost of field operators to the wells, which allowed them to increase the completion of other meaningful tasks by focusing on other field duties. Control of the fluid level to target was accomplished as programmed into the Smart Pumper™. The product also eliminated all unnecessary operator, PE and RE intervention with regard to attempting well optimization. The Smart Pumper is much cheaper than Data Loggers that only log data. The installed sensors and cables provided have worked effectively for the past 12 months. The Smart Pumper PLC is manufactured in Dallas, Texas. Site inspection of the facility can be arranged by appointment only. Automation Packages are assembled, tested and shipped from Houston, Texas. The example shown is for a water aeration system with a 40 HP VFD. Prior to shipping, units are bench tested to a motor stand to confirm VFD set-up and motor response is perfect. Further, the communication within the Smart Pumper is activated and tested with the web interface to insure control and data acquisition elements are properly set-up for the customer to deliver a truly plug-in-and-play solution to the field that is set up to run before it gets there. Call us to set up a live demonstration. Once installed, the Smart Pumper TM Automation Package will control virtually any device and can be accessed from most anywhere within minutes. Use it to control and monitor any form of artificial lift to pump any type of fluid, manage fluid injection sites, water aeration and transfer pump stations, electric generators and more. The simple to use “open platform” requires no step ladder programing; just select the target fluid level you want and the number of days to achieve the target and the unit will perform this duty automatically. It will perfectly match well or tank inflow rate with a pump speed output rate while at the same time provide you with many more options like automated chemical injection to run in harmony or independently with the primary pump. Then name and scale the sensors deployed to provide the data you require. Set conditions for each sensor and the response to be taken. Define your tank sizes and it will calculate your inventory. Define and scale your meters and it will gather your meter data, manage tank levels, protect pipelines and more at the same time from one very smart box we named the Smart PumperTM. The Smart Pumper TM will interface with 8 A-D sensors, 8 Digital IOs, and Modbus to control and monitor most VFDs while gathering data from up to 5 Meters. With this capability, you can get down hole pressure and temperature, tubing, flowline and casing pressure, Oil and Water Tank Levels, control a series of chemical pumps, open and close proportional valves, activate and monitor Compressors or other, and still have a few more open channels for doing more. All 16 channels are nameable and scalable and once set up appear in the web as you defined. From all these inputs and capability, you will be able to gather and see up to 52 data points for report generation, accounting and analytics. The more aspects of your operation you automate and protect with the Smart Pumper, the more you will be able to manage and in effect add to your bottom line. Our technical team will help you through this process and the operating manual will also answer most of your questions. Installation Teams are located throughout North America and are deployed overseas from Houston and Trinidad to provide first time users with set up experience and training until their well completion teams can install for themselves. Trans-Ocean container packing and shipping is also managed from the Smart Pumper Houston assembly facility.